The summary introduces the job candidate’s diversified experience in financial and company development and revenue/profit/continuous improvement. The “Highlights of Expertise” section contains branded keywords such as business planning, budget administration, cash flow optimization, recruiting and process redesign. The initial experience statement below his job title describes his major tasks with achievements listed as bullets. The accomplishments demonstrated increased revenue, successful audits, leadership and strategic improvements. 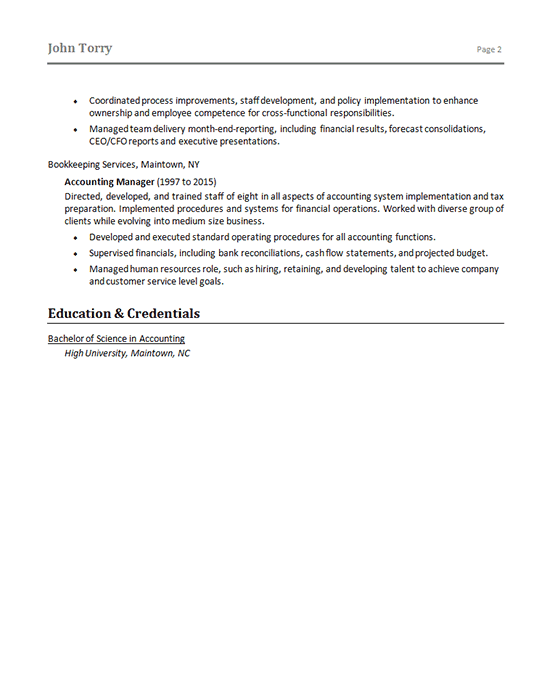 The second page shows previous job as a financial manager and the B.S degree in Accounting. 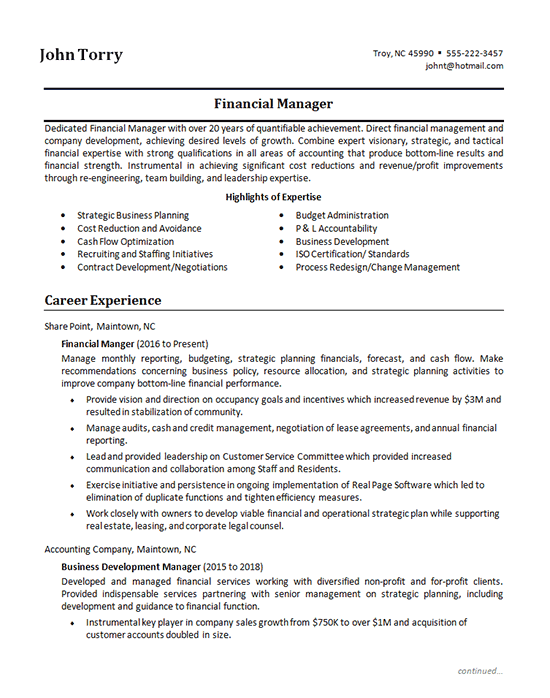 Dedicated Financial Manager with over 20 years of quantifiable achievement. Direct financial management and company development, achieving desired levels of growth. Combine expert visionary, strategic, and tactical financial expertise with strong qualifications in all areas of accounting that produce bottom-line results and financial strength. Instrumental in achieving significant cost reductions and revenue/profit improvements through re-engineering, team building, and leadership expertise. Manage monthly reporting, budgeting, strategic planning financials, forecast, and cash flow. Make recommendations concerning business policy, resource allocation, and strategic planning activities to improve company bottom-line financial performance. Provide vision and direction on occupancy goals and incentives which increased revenue by $3M and resulted in stabilization of community. Manage audits, cash and credit management, negotiation of lease agreements, and annual financial reporting. Lead and provided leadership on Customer Service Committee which provided increased communication and collaboration among Staff and Residents. Exercise initiative and persistence in ongoing implementation of Real Page Software which led to elimination of duplicate functions and tighten efficiency measures. Work closely with owners to develop viable financial and operational strategic plan while supporting real estate, leasing, and corporate legal counsel.